The much awaited audio of Pawan Kalyan’s upcoming film Cameraman Ganga Tho Ramababu is going to be launched on September 21. Puri Jagannadh is directing the film and already the entire talkie part of the film has been wrapped up. The film’s shooting will be wrapped up in couple of weeks. Tamannaah is playing the lead role and she’ll be seen as a TV journalist, along with Pawan Kalyan. Gabriela Bertante and Prakash Raj are also playing important roles. Mani Sharma is composing the music and DVV Danayya is producing the film. Pawan Kalyan’s recent film Gabbar Singh was a musical blockbuster and fans of Powerstar are expecting that Cameraman Ganga Tho Rambabu will also repeat the magic. Already, the film’s posters which were unveiled few days ago have got terrific response. 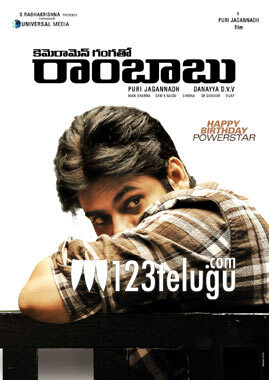 With the film gearing up for worldwide release on October 11, ‘Pawanism’ will be at its peak once again this year.